Is your Sheltie jumping up to greet you when you come home? Does he try to get in the face of house guests? Does he pester young children? Not everyone appreciates your Sheltie jumping up at them. Here's how to curb this behavior. Jumping is rarely a problem for the dogs themselves. In fact, jumping acts as a reward in itself. And it needn't be a problem for owners either. Pete and I love physical play with our Shelties and this means jumping all over the place. However, there are times when you need to know how to stop your Sheltie jumping. Whether it's to avoid muddy footprints all over the couch, freshly clipped claws sinking into your skin, offending dog-fearing guests, or scaring young children. There is a command you can use to curb this behavior. First, we have to accept that we've entrained this behavior in the first place, even if we don't realize it. Many dog owners inadvertently encourage jumping behavior in puppies. When a tiny Sheltie puppy comes gamboling up to us, wiggling with excitement and making small, clumsy leaps at our knees, it's natural to lean down and respond in kind. But we effectively reward the jumpy greeting by reacting with exuberant affection, hugs and petting. The puppy learns a fast lesson: jumping is good because it results in plenty of positive attention and physical contact. Your dog doesn't understand the difference between jumping as a small, cute puppy, and jumping as a big adult. To a dog, a greeting is a greeting, and to him, aging by a few months is no reason to stop jumping. So to curb inappropriate jumping you'll need to take matters into your own hands, and make it perfectly clear to your dog that jumping is not always an option. When is Jumping Not Appropriate? 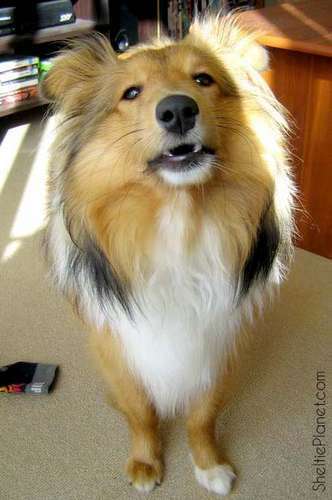 Many owners of smaller dog breeds like Shelties actually expect them to jump up. In small dogs, jumping seems to be viewed as a sign of excitement and affection on the dog's behalf. The good news is that these dogs aren't likely to knock anyone flying when they're feeling rambunctious, and they're small enough that their size usually won't intimidate any but the youngest of children. On the other hand, there's rarely a time where strangers will actively welcome being leapt up on by an unknown dog, regardless of his size. So ultimately, it's just good form to teach your dog the "off/down" command, so that you're prepared for those incidences when you're not directly on hand to stop the jumping yourself. For owners of large-breed dogs, the "off/down" command is mandatory. Big dogs are often taller than humans when they rear up on their hind legs - and just imagine the experience from a child's point of view! In fact, they're often heavy enough to knock smaller adults tip over tail. At the very least, a large dog's paws are heavy enough to gouge clothes and exposed flesh. So ultimately, any kind of jumping that involves anyone apart from yourself is bad form. Responsible owners should arm their dogs with a reliable recall to the "off/down" command - just in case the other person doesn't want your beloved butter-wouldn't-melt Sheltie jumping all over them. Why Else Do Shelties Jump? 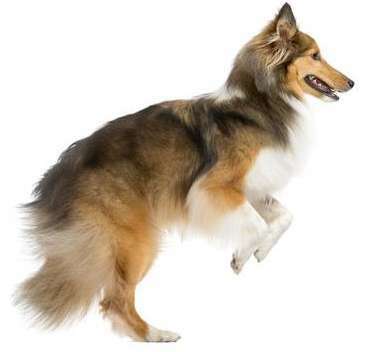 We know now that most Shelties jump as an enthusiastic greeting when adrenaline's running high and your dog is happy. In fact, many dogs don't jump at all apart from when their owner returns home after a relatively prolonged absence (like the average workday). If your Sheltie is leaping up in these circumstances, he's literally jumping for joy. A less common, but more serious, reason that some dogs jump is to exert their dominance over you. Dogs are pack animals: they live in designated hierarchies of social rank and order. When a dog needs to assert his dominance over a lesser animal, one way of doing so is to declare physical superiority, which is usually done by jumping up: he'll sling one or both paws over the other dog. If you think your dog is asserting his dominance, you need to adjust your overall relationship with your dog, and brush up on your alpha-dog mindset. Dog trainers point out that the most effective way for you to stop unwanted behaviors is also the easiest. All you have to do is simply ignore your dog whenever he jumps up. Give him the cold shoulder. Withdraw all attention, even negative attention (don't yell, shove, or verbally correct him). Since dogs understand body language a lot more clearly than the spoken word, use your posture to send the message. Fold your arms, turn your back, turn your face away and avert your eyes. Now this is where a lot of people make a mistake: they confuse ignoring the behavior with ignoring the dog. Don't carrying on petting the dog and pretend the jumping isn't happening. You have to ignore your dog full stop, just for a few moments. He'll catch on very quickly. When all four paws are on the ground, you can praise your very clever Sheltie! Don't be confused by the rapid switch between negative and positive reinforcement. Dogs have a very short training memory, and only associate a reaction from you with whatever behavior they're exhibiting at the exact time of your reaction. So, it's perfectly OK to react with wild enthusiasm the very second that his paws touch the ground, even if you were cold shouldering him the split-second before.